Before sharing the details about the location of the Chiang Mai Rock Quarry. Check out the video below that my friend Jairet made from our trip. 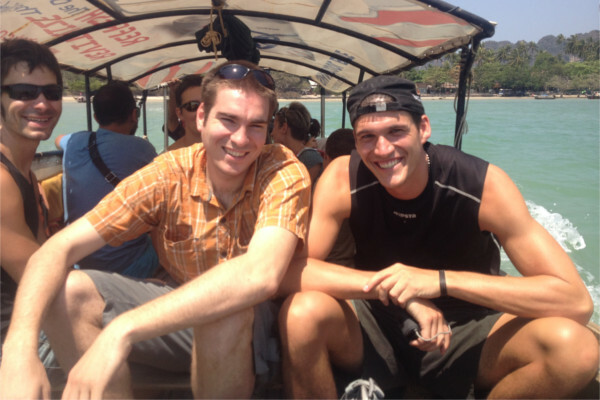 I also shared another video from a fellow travel blog. Check them out! 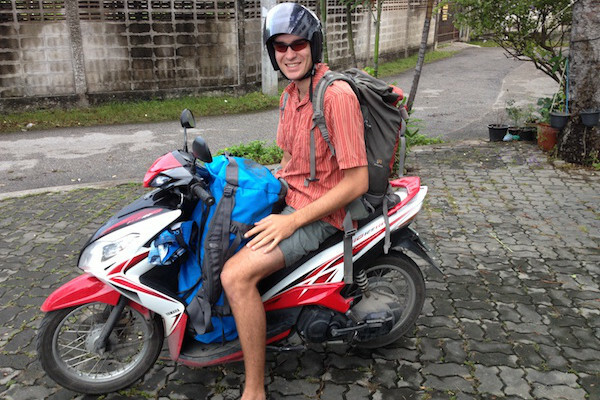 Here is another sweet video from a travel blog titled, Unevensidewalks. 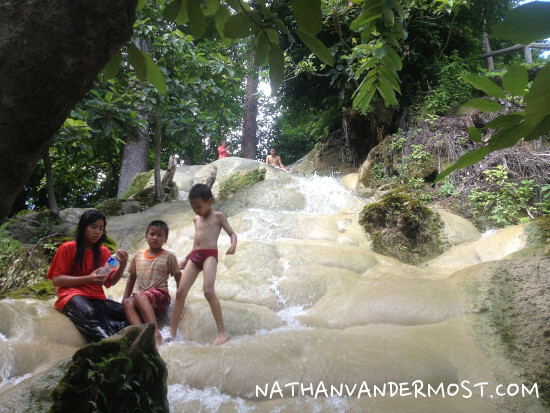 At the time of writing this post, this last weekend, a fellow English teacher invited me to go with him to find the elusive Chiang Mai Rock Quarry. He told me that he had heard of an old rock quarry that is about a 30 minute motorbike ride away, Southwest from the old city of Chiang Mai. 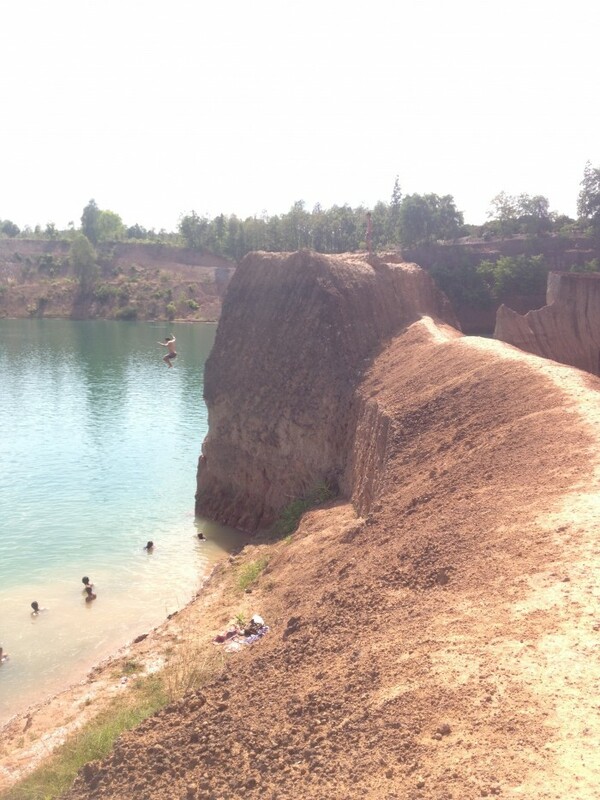 The rock quarry is now abandoned and is full of water which attracts local Thai and foreigners. There are unique rock formations that surround the rock quarry and make for great cliff jumping from a variety of heights. I was interested to find the quarry and so we decided to venture out and see what we could find. Fortunately, with the aid of our smartphones we were able to get directions and navigate to the elusive quarry, south of Chiang Mai city proper. The basic directions are to get onto highway 108 and take it south of the old city. After passing the airport, you will make a right onto highway 121. After following highway 121, turn left onto canal road and go for a few miles. Following you need to make a right and the quarry is 5 minutes up the road. I went to the quarry via motorbike. If you do not have one or do not want to rent one, I would suggest to get a group together and go via a red songtao truck (taxi). 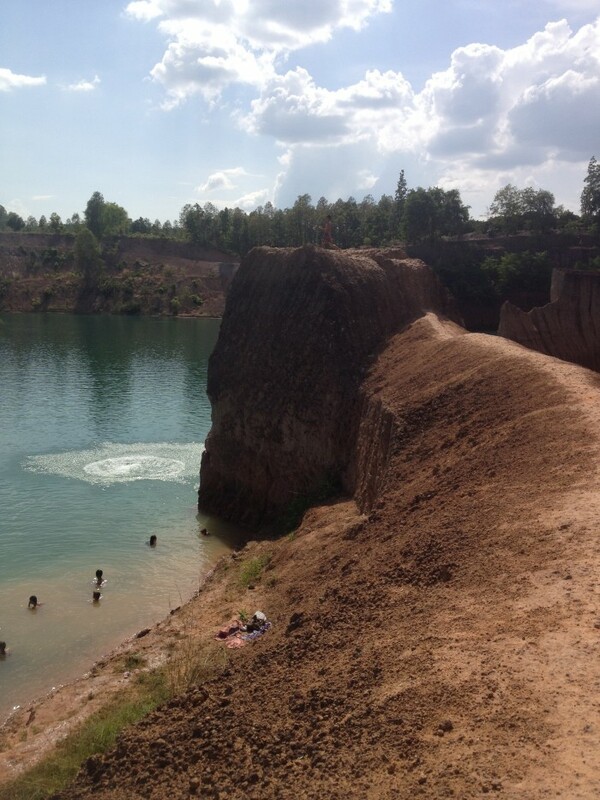 What to do at the Quarry? After arriving, we parked the motorbikes and got a good view of the quarry. 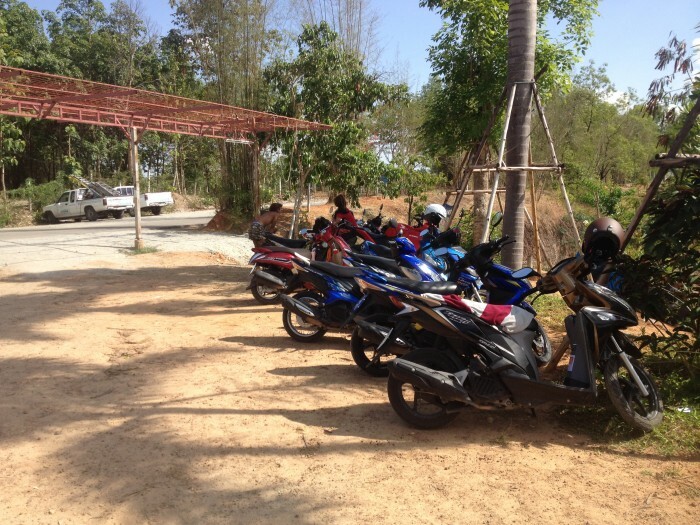 There is plenty of parking for motorbikes. When looking at the quarry from the vantage point of the parked bikes, you can either go to the left or go right on an elevated narrow clay ridge. The ridge has plenty of cliff jumping opportunities to the left. The height is about 5 meters or 15 feet. If you walk further down the ridge, than you can scramble down a steep ledge on the left, to a small rocky beach on the water. When we arrived in the mid-afternoon on a Saturday there were a lot of people visiting the quarry. There was a few local Thais and foreigners enjoying the cool waters of the quarry. A refreshing escape from the heat! After scrambling down to the rocky beach and dropping off our packs we ventured back to the ridge for some cliff jumping. I am not a huge fan of heights but was able to get the courage to jump off the 15 foot cliff. After jumping off and landing in the water. I came up for a breath of air and immediately had pain in my left ear. Jairet, was fearless and immediately jumped off a higher ledge. We approximated that the ledge was about 8-10 meter or 25-30 feet. Crazy! For the rest of the afternoon, we jumped off a few more cliffs and socialized with other travelers that were also visiting the quarry. There are other cliffs that you can jump off but they are not as easy to access. 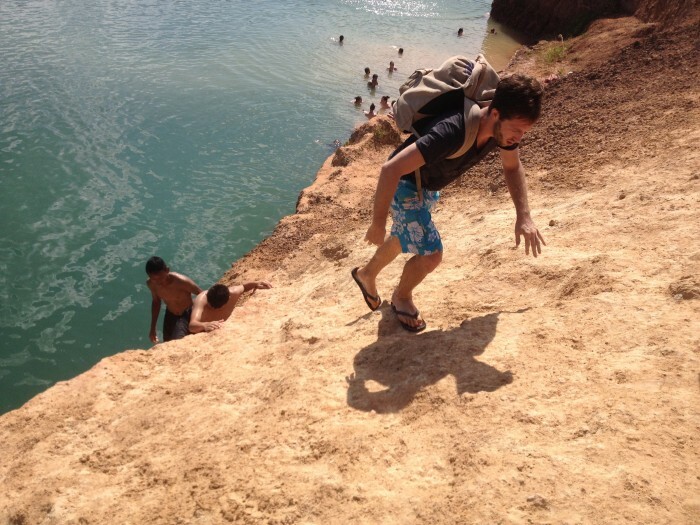 Also, whichever cliffs you jump off of, be sure to know where you can get out. There are only a few areas that have access to a “beach,” that get you access back to the ledge. If you enjoy swimming, the quarry features a lot of swimming opportunities and different areas to explore. I would encourage you to be a confident swimmer and know where you can get out safely before diving in. I had also heard rumors that the year prior, there were some locals that drowned while visiting the quarry so be sure to be mindful and have fun!